Overheard at the opening of Cave: ‘It’s all a bit hippy trippy, isn’t it.’ A quick scan of the exhibition: crystals, glitter, stone circles and an actual cave, complete with fog. Yes. Yes it is. But there’s a lot more going on here. Cave is Jessica Herrington’s exercise in artifice – a wickedly gleeful tour through poetics of illusion and value. Ugly vs. beautiful and useless vs. useful have long been front and centre in Herrington’s practice. Earlier forays in two dimmensions saw her hulking paint onto the canvas in a way which made you wonder if she was trying to create the ugliest thing you had ever seen. The very same works often featured garish smatterings of glitter, or unexpected belches of acrid colour, to ensure the viewer remained perpetually bamboozled as to how to read these lumps of muck presented in a pristine gallery environment. More recently Herrington moved into 3D constructions, but a residency at the ANU’s Research School of Chemistry has provided her with the catalyst (sorry) for her work’s most significant shift. 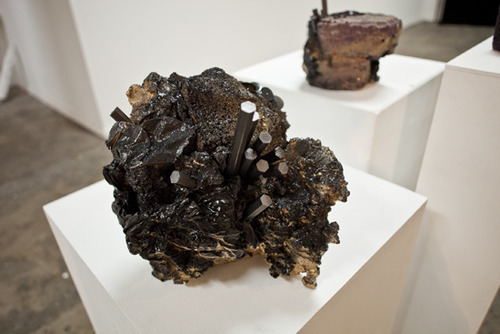 Now, by developing and encouraging the growth of crystalline structures Herrington is able to conjure her works into being – playing God in the creation of the beastly/beautiful – a hybrid of the banal and utilitarian (a sponge, a housebrick) with the supernatural sciences (crystals, precious metals). Hunks of nothing are transformed into glinting treasures, with Herrington as alchemist. Notions of mysticism and preciousness are played to the helm – the exhibition’s stone circle in particular is an adamant nod to our persuasive pagan pasts. This, paired with ultra low lighting and swirling mists (read: fog machine) from the cave, nominate the stony serious manner in which the other assembled objects ought be viewed. If this sounds like it should all be quite humorous it strangely is not. Herrington has successfully doctored an entire environment to represent the very ideas of sacredness and inflated value she brings to question. Even audiences who step inside the cave (as you are invited to) find themselves enveloped solemnly within its glowing belly and completely forgetful that it is, in fact, constructed from loads of cheap timber, foam, glue and paint. Manipulating our superstitions and love of the supernatural through the teachings of high science Herrington presents an exhibition that is as transformative as it is tacky. What isn’t clear is whether she is laughing with us, or at us. Tomorrow (Saturday Nov 13) is your last day to see Jessica Herrington’s Cave at CCAS Manuka. It really must be seen to be believed.